When I was invited to be featured on an Awarepreneurs interview, I was delighted. Paul Zeilizer is the host of the show and we are on the same page when it comes to marketing with integrity and flipping the script to focus on PASSION points. Paul focuses on coaching conscious entrepreneurs in business and marketing . His clients are committed to doing deep transformational work. He also works with leaders on growing their capacity to lead skillfully and mindfully. He is the Founder of Awarepreneurs. Paul and I have been connected for many years and he’s been a wonderful champion of my simple 3-Step “Challenge. Solution. Invitation.” framework to improve all communications and create marketing messages with integrity. 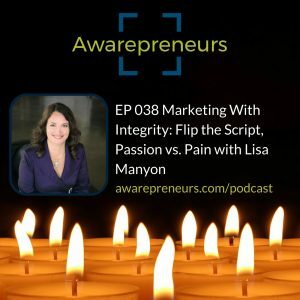 During this Awarepreneurs interview – – Marketing with Integrity: Flip the Script. Passion versus pain we go deep. This is a candid discussion about my business journey, what’s working in marketing and copywriting and what’s not. We also dig into spiritual bypassing, the energetics of marketing and more. Click here to take a listen and share your comments. We’d love to hear your thoughts via comments on my blog below. This entry was posted in Resources and Interviews	on Monday	June 22, 2018 at 1:45 pm. You can follow any responses to this entry through the RSS2.0 feed. You can also leave a response. Ask Lisa: What if I don’t have case studies or results to share? Ask Lisa: How often should I post on my blog? Ask Lisa: How do I overcome sales objections? 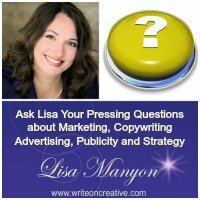 Ask Lisa: Will you sell my products or services for me?